disc cred: Creator of the Western Indiana Frozen Fundraiser Series. It has grew from 6 events to 11 in 5 years, and raises about $15,000 for different charities throughout Indiana. 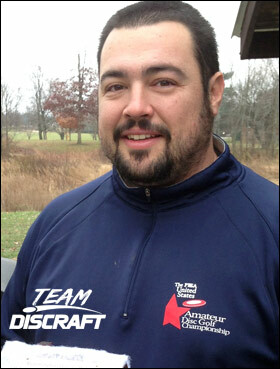 My most memorable disc golf moment was winning advanced while shooting the course record at the final tournament held at Pieradise Disc Golf Course in Peru, Indiana. Terre Haute, IN My home course with rolling hills and mature trees, it has so many different ways to make easy layouts one day and punishing layouts the next. Valpo, IN Great mix of technical and long with natural OB. Minneapolis, MN I grew up in the Adirondack Mountains, so playing on a well manicured course with all those trees made me feel at home. Rochester, NY My home away from home, a course that will make you use every shot in your arsenal. Georgetown, IN Another great course that will make you focus on your shot selection and punish you for not executing. Z Nuke is my go to driver. Forehand, backhand, roller, tomahawk. Z Force is my wind driver. Fast and predictable. Z Nuke OS is my meathook. For those times you need it to go out around something and suddenly fall out of the sky, the OS abides. ESP Pulse ESP Pulse is my thread for needles. Long tight fairways are no issue with this in my bag. Z Buzzz Z Buzzz, my go to mid. Put it on a line and watch it soar to the basket. Ti Drone Super stable mid with great glide. You can turn it over, but not for long. Ti Zone Dependable and stable short range mid / long putter. D Soft Magnet The softer the better, nothing more pure. The only disc still in my bag from the beginning.